Today's "Godcast", from an Old City of Jerusalem scholar and bestselling author, explains the critical role of the human touch to enliven a soul in pain -- bringing to mind the maxim that "without the Divine, we cannot -- and without us, He will not." Buy at a discount by clicking HERE. Think your life is messed up? Jewish Spirituality: Fusion or Confusion? 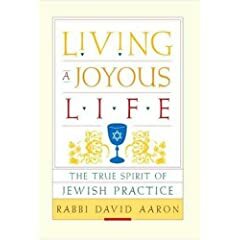 Judaism: Full of Joy or Full of Oy? Humans as the Divine's cheap thrills?